Following a recent informational meeting that internationally renowned award-winning writer and investigative journalist, human rights advocate, and US-Europe Joint Investigation Team Press Officer Ramola D/Dharmaraj had with Central Middle School Principal Richard DeCristofaro, Jr., on April 12, 2018, to which he mid-way invited his Vice Principal Ms. Susan Shea Conner, Mr. DeCristofaro made an injurious and malicious false allegation of “Child Neglect” to the Massachusetts Department of Children and Families, which has resulted in a wrongful, wasteful, stressful, and wholly unnecessary “investigation” being opened on this writer and her family. Ramola D had pre-scheduled the appointment, wherein she provided Mr. DeCristofaro, Jr., information related to her Art, Creative Writing and Natural Science workshops for children, as well as important public-interest information regarding a subject endorsed and supported today by FBI, NSA, and CIA and other Government and military whistle-blowers pertaining to the wrongful use of electromagnetic anti-personnel technologies on Americans, about an unpleasant experience of Remote Electronic Assault (recorded in an affidavit) that she was subjected to on March 28, 2018, on school grounds during the Middle School’s Science Fair where her daughter’s team won an award for their science project. While many may be unaware of the reality of Remote Electronic technologies being used on citizens, NSA, FBI, DARPA, CIA, US Navy whistleblowers are on record informing all that these military technologies do indeed exist and are being used today by criminal miscreants in power in the “Deep State” to silence community activists, whistle-blowers, prominent, exceptional, and civic-minded American citizens who express their views openly in simple exercise of their First Amendment rights. It is a well-known and prolifically documented fact that such electro-magnetic weaponry exists and has been operational for decades, used by the military and intelligence agencies (including but not limited to FBI, CIA, NSA, DIA DARPA) against persons deemed “dissidents,” whistleblowers, journalists and expositors of vital information which should be of concern to every American who values the God-given, unalienable rights and liberties enshrined in the Declaration of Independence and the U.S. Constitution, and specifically the Bill of Rights contained therein….I am one of many former intelligence professionals, an independent investigator, intelligence analyst and journalist, who, for more than a quarter century, has been documenting and publicly reporting on the high-tech anti-personnel weaponry used against us. There is indeed a Secret Government of unelected bureaucrats who have no intention of allowing the populace a voice in their own future, and the façade of a Democracy is fading fast with the advent of America’s version of Brown Shirts run by DHS through the FBI, which clearly has a long history of trampling our rights (COINTELPRO) for political gain. The FBI is spearheading the most colossal and evil attacks on people ever conceived on the face of the Earth, and they are using Deep Space-based technology, they are using Bio-Chemical Viral Warfare Elements and Agents, and they’re using Psychological Warfare to destroy people. Through regular seminars and public conversations on their weekly podcast Techno Crime Fighters Forum, the US-Europe Joint Investigation Team has sought to educate the public about Anti-Personnel Electromagnetic Technologies which come under the rubric of Directed Energy Weapons, Neuroweapons, Electronic Warfare, and Non Lethal Weapons. “Electronic,” a Military term for electromagnetic and acoustic “Spectrum” weapons, categorizes the entire branch of Electronic Warfare, which includes EMP and Star Wars SDI (Strategic Defense Initiative) weapons like lasers, masers, and particle beam weapons designed to knock out computers and battleships, as well as highly invasive “anti-personnel” microwave pulse, sonic, and scalar weapons which essentially act as bio-hacking weapons and can produce specific bio-effects on human organs, nerves, brains, and body parts. Some of these bio-effects are described in the Department of Defense’s declassified document, Bioeffects of Selected Non-Lethal Weapons made available on FOIA request in 2006 to Donald Friedman as well as to Dr. Millicent Black, Pastor and Research Analyst on the US-Europe Joint Investigation Team. Bio-effect information has also been published in the 2002 Air Force Research Laboratory report Biological Effects of Directed Energy, summarizing findings from a contract with Veridian Engineering, and in the USAF Radio Frequency Radio Dosimetry Handbook, which spells out the known dosages of radiation and frequencies which affect different body parts, projects the US like Russia has been working on for decades, since the 1950s. Information such as the above is known to investigators and journalists studying these subjects, and is increasingly being disseminated in the public interest, as reports come pouring in nationwide and worldwide on the illegitimate use of these weapons on civilians. In March 2016, the Polish Minister of Defense acknowledged publicly the reports of civilians alleging electromagnetic-technology assault, and promised to look into them. Most recently, in February 2018, Dr. Robert Duncan, the Harvard-educated DARPA/CIA scientist whistleblower who has worked also for Army, Navy, DOJ, and admits to helping create electromagnetic neuroweapons, while speaking on Polish TV at the occasion of the 8th International Day Against Mind-Control referred to these weapons as “some of the most horrific weapons humans had ever conceived of” and stated he is working “to create defenses and alert the public about these weapons” as he calls for all countries using them to sign a treaty to ban the use of these weapons on citizens. Today, intrepid independent journalists, activists, and researchers including Ramola D of The Everyday Concerned Citizen are acting en masse online to educate and inform the public as they seek to remedy the great disservice done to humanity by mainstream media like The New York Times, the Washington Post, Vice, The Daily Beast, Wired, Wikipedia, and others, who are known to be propped up by the Deep State, and continually publish Propaganda coverage to conceal the Crimes Against Humanity testing, operation, and use of these Directed Energy Weapons and Remote Anti-Personnel technologies on citizens worldwide—famously calling all reporting victims of these crimes paranoid and delusional. Massachusetts State Police is listed among the listed police departments as a market for these “non-lethal” technologies. The Chief of Police in Massachusetts however, as head of the Commonwealth Fusion Center, in May 2015, declined to provide on FOIA request from investigative journalist Ramola D a list of the non-lethal weapons in use on the streets in Massachusetts, citing “Public Safety” although indeed it was concern for Public Safety and the importance of transparent disclosure to the public of all weapons, including silent radiation weapons, which had prompted her request. To add: Massachusetts, notably, is one of only two states in the US (the other is Michigan) with a law on the books regarding Electronic weapons, prohibiting the possession of electronic weapons–“weapon from which an electrical current, impulse, wave or beam may be directed, which current, impulse, wave or beam is designed to incapacitate temporarily, injure or kill”–by civilians and permitting them to be held exclusively by police. The information provided by Ramola D to the Principal on April 12 therefore regarding these sophisticated technologies, which include satellite and cell-tower technologies, and offer the ultimate stealth vehicle for the assault of humans at a remove, from a distance, was offered in the public interest, with greatest concern for the public at large, including the children at the school. Ramola D informed the caseworker on the spot these allegations were false A to Z and she disputed them, noting that it appeared her informational visit with Mr. Richard DeCristofaro Jr. and Ms. Susan Shea Conner had been misunderstood by them. To investigate this matter further, Ramola D/Dharmaraj has made Public Records requests via Muckrock to the Quincy Public Schools Administration, Quincy School Committee, and the Department of Children and Families for all communications regarding herself and her daughter, and written a letter to the Governor to inform him of the exact details of this situation and request his intervention to stop this injurious false investigation based on libelous charges in its tracks. Essentially, what has happened here is that an investigative journalist who has worked consistently to research and report on concerning military technologies and raise public awareness has been slandered and defamed by Quincy Public School officials who have made an egregiously false, unsupported, and reprehensible allegation of Child Neglect to the Department of Children and Families in the case of an exceptionally talented, contented, thriving, and high-performing child, who enjoys a happy, contented family life with her family and community, suffers absolutely No neglect, and certainly does not need the intervention of State services. Is investigative journalism now mental illness, according to Quincy Public Schools? What is at stake here currently in Massachusetts and the USA is Freedom of Speech and Freedom of Reportage. Concerned citizens, media, and investigative journalists everywhere are invited to take discerning and thoughtful action to peacefully quell this encroachment on our common rights and liberties and cover this story further. It is to be hoped that the Massachusetts Department of Children and Families drop this false investigation immediately. Those benefiting from the public-interest investigative journalism at The Everyday Concerned Citizen, at Ramola D Reports, and by the Joint Investigation Team may wish to inform Quincy Public Schools and the Quincy School Committee of the difference between factual investigative reportage (backed by Government whistleblowers) and “untreated mental illness.” Ramola D, who is seeking a Civil Rights attorney to address this defamatory charge of mental illness which amounts to “tortious interference” attempting to intimidate and silence her vitally necessary journalism and voice, will be available for interviews, seminars, and podcasts. Please share this Press Release widely. 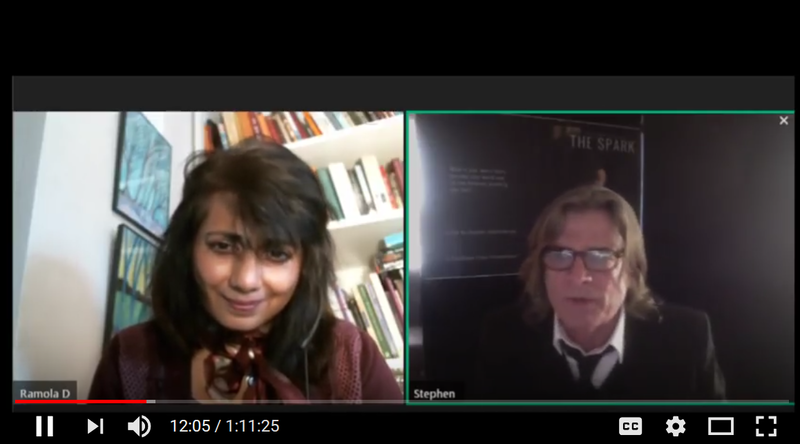 I recently had the pleasure of speaking with actor and filmmaker Stephen Shellenberger on the subject of his new film, The Spark, released online currently at his website for an incredible discount, please visit there to view, please share widely. In a wonderful impromptu conversation opened by a musician friend Bob spilling exquisite notes and lyrics hinting at alienation into the moment, Stephen Shellenberger offers candid insights into his creative process and approach in the making of this elegant art film set in Montreal. Thoughtful, straightforward, and matter-of-fact, Stephen delves into the beauty and meaning of art and talks about his own experiences of having been moved by great art, such as the statue of David by Michel Angelo in Florence, and about the need to be moved and to relate to the world at the level of heart, not merely mind, and how art in this way offers in a sense a true pastiche of world experience across time, more than the histories of war and governments does. Released April 20 at his website, for the modest price of 1.99 for a week: especially recommended to those experiencing unlawful targeting or surveillance, for friends and family, to raise public awareness through art. Support Stephen Shellenberger at Patreon. A gorgeous art film with the added bonus of a gripping narrative, The Spark offers a compelling glimpse into a world uncannily like our own, a modern dystopia spiked with high-tech surveillance and low-tech stalkers surrounding a central figure steeped in his own story of love, loss, and remembrance. Stephen Shellenberger, award-winning actor, artist, poet, and filmmaker with an eye for the visually appealing and keen sense for the power of story acts, casts, writes and directs in this subtly artful film set in Montreal. A man with memories of a beautiful ended relationship begins to catch glimpses of his beloved in a new and distant urban setting far from the days of his romance in Paris, while at the same time his own life seems to mysteriously unravel. Unclear himself what exactly is going on around him as he notices signs of apartment break-ins and experiences a loss of trust from close colleagues, he begins to treat every encounter with strangers, neighbors, an attractive though uninvited companion on a train with dawning suspicion. The world in which he lives is a modern world “where the originals are being replaced,” where cloning and genetic editing and transhumanizing are a sudden fact of life, where the future is marked by “lunatics, heretics, and sick pedophiles,” where some who rule are ruled by no limits on their greed for control—all unhappy reminders of our own reality in this millenium. It is a surveillance-infested world where deception and disinformation crowd the atmosphere, where no-one it appears is what they seem, where dark-intentioned agents crowd everyday around targets and seek to modulate their thoughts and actions. All around him throbs a succession of odd encounters; trapped in a Kafkaesque loop of repetitions he soon begins to distrust his seeing and spins deeper into himself as he steps further into the world, speaking only to a select few around him. Spiraling down the rabbit hole he learns more eventually than he had ever bargained for, tossed around by question after question, not offered the truth of what he is experiencing until the very end, when unexpected validation of his deepest misgivings is proffered. Because he is lost and haunted by his need to find the truth and meaning of his experience, we too are lost and tossed with him inside the seas of his unknowing–the emotional intensity of the experience keeps the viewer enthralled. A #MustWatch for those awakened keen to make sense of our varied lives today, uniformly impacted by larger substructural realities such as Satanism and control, The Spark could be shown in schools and colleges as a great way to offer insight into the reality and nature of our surveillance-ridden world today, trapped as we are with the surround-sound of science fiction morphing into fact and the roster of bizarre technologies promising to take over humanity expanding at every step. And what of the spark of life, learning, discovery that throbs like a distant heart pulling him closer and deeper into the truth of his own experience? Haunted, targeted, pursued, a fiery light still burns inside him. Supported by a cast of striking women and men actors who each leave their own indelible mark on the film, The Spark is both elevating and unsettling, a provocative and dramatic vignette for our times. Suzie Dawson, New Zealand journalist, Occupy activist, Snowden documents researcher, Internet Party leader, and on-air #DecipherYou analyst with Elizabeth Lea Vos of Disobedient Media, set Twitter alight last night with some candid and revelatory tweets calling attention to Directed Energy Weapons in use by militaries, the overreach of Intelligence agencies in expanding their circle of targets as they seek more and more funds and grow ever more authoritarian and out of control, targeting “suburban soccer moms, grandparents, and students” with exotic weapons. Calling on journalists who may have been too scared to touch this subject, she notes that Intelligence agencies have gotten away with their criminality for too long and asks journalists to step forward to cover. Please retweet and repost Suzie’s vitally important tweets as the movement by concerned citizens and human rights activists to inform the world about the reality of electromagnetic weapon use on civilians–who, when reporting Surveillance Abuse with EMF and neuroweapons are continually dismissed and discredited as delusional “Targeted Individuals”–gains steam. Please support Suzie Dawson’s efforts to inform the world and to expose the criminal targeting abuse we are all reporting by sending her documents and links online, and retweeting her important tweets above. Suzie’s work is critical in this struggle to reach mainstream audiences–being brainwashed by Mockingbird-style media deceit and propaganda–because she has been closely studying and reporting on those Snowden documents already released, and has been covering Surveillance for a long while now, as her tweets illustrate. Much gratitude to Suzie for stepping out and taking a stand here for all those being emasculated by the venal megalomaniacs in the Intelligence agencies, militaries, and military-industrial complex who are pulling in increasingly fat paychecks while those thousands and millions of accomplished and innocent citizens they target intensively with high-tech radar, microwave, scalar, sonic technology and covert implants experience the utter destruction of their lives. Please repost and share this post widely, with attribution and linkback.